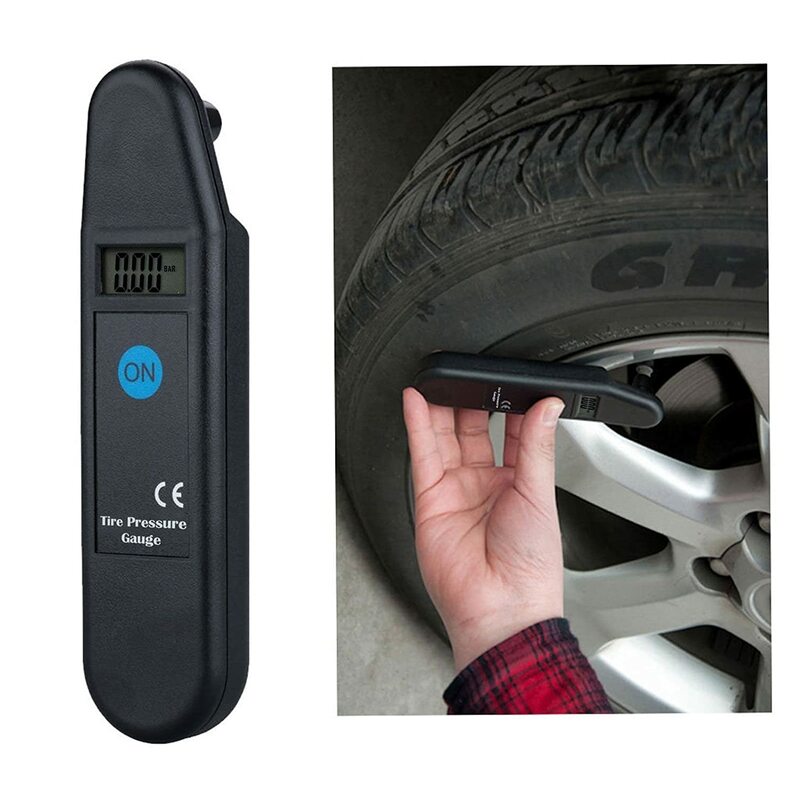 ➲With manometer, you can control tire pressure to what your tires need. ➲Digital tire inflator is equipped with bright and long-lasting LED lights for easy night use. 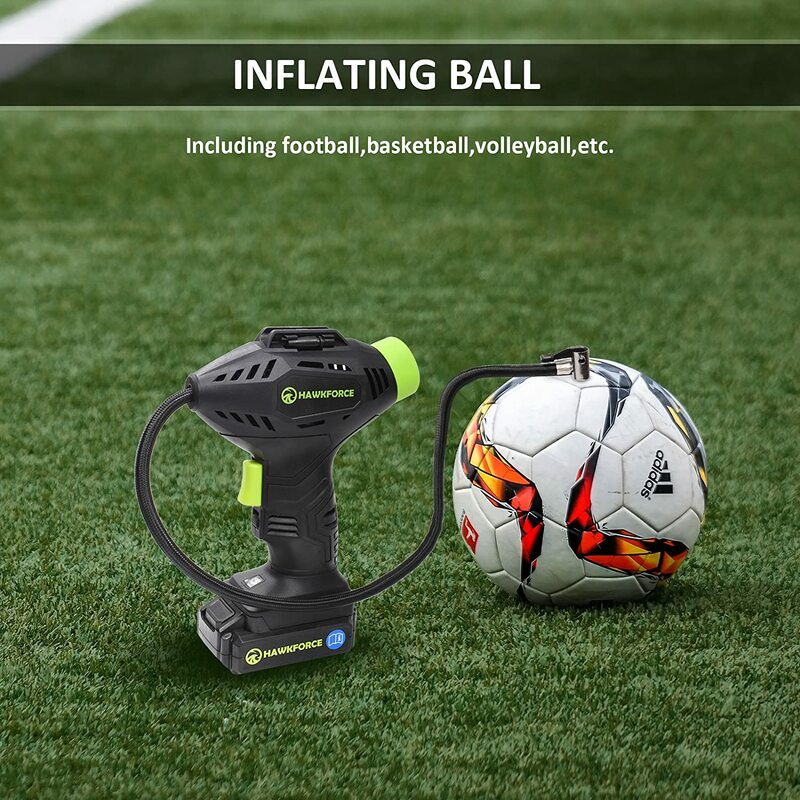 ➲Electric air compressor Pump do not need to connect the power adapter when you use it, with 1300 mAh lithium battery can be used anywhere. ➲Includes nozzles + pin attachments. Flexible hose to get the right angle. Suitable for bicycles, motorcycles, small/medium-sized cars, toys, sports equipment, air mattresses and other small inflatable products. 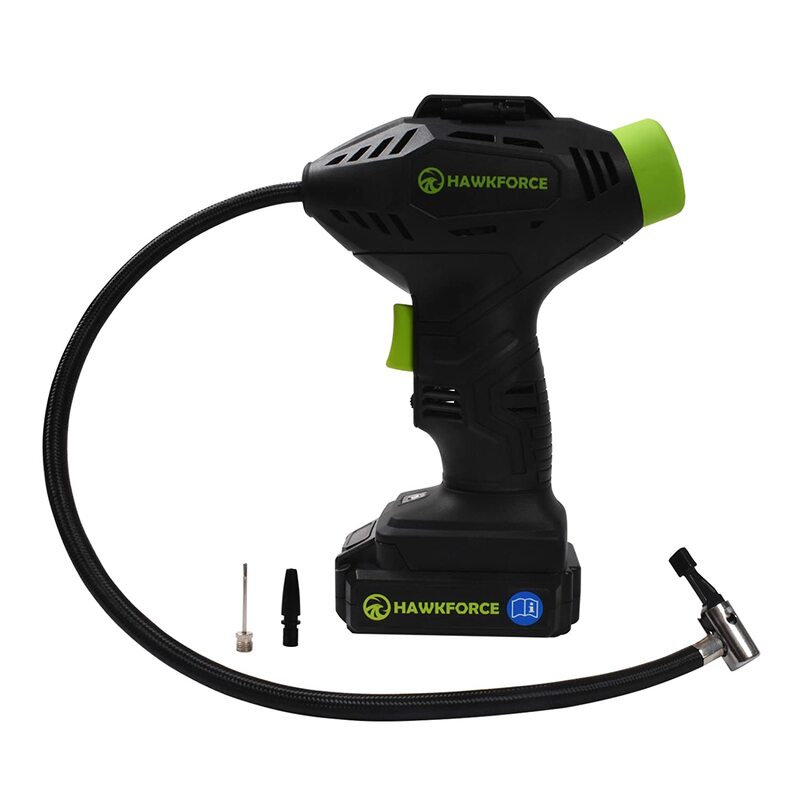 This cordless rechargeable inflator is something you definitely are gonna need it! I've tried so many inflators before this one, they are nothing when comparing to this kind. 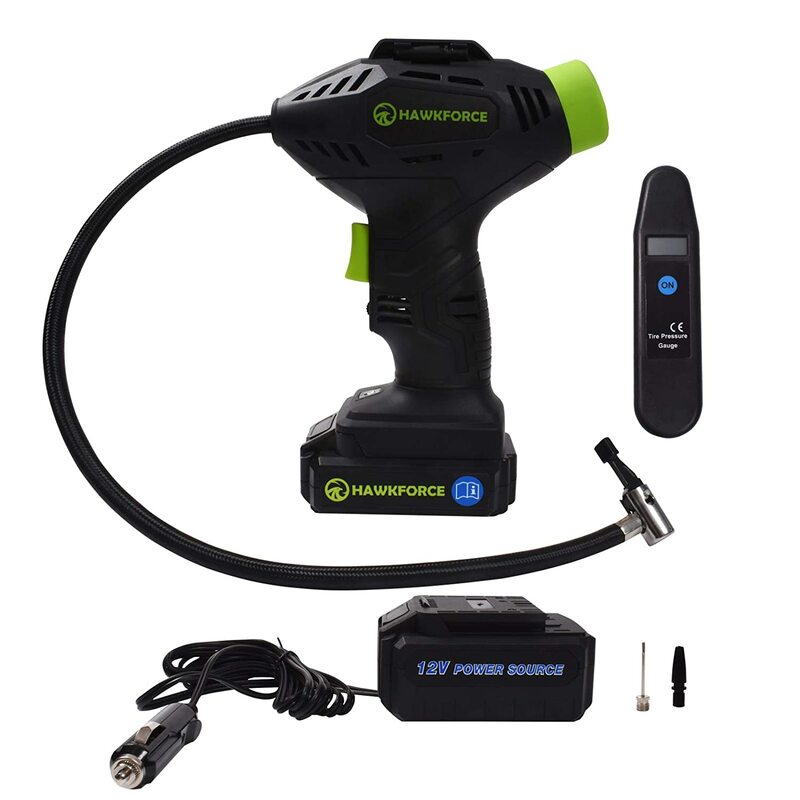 I like the way it works, which doesn't bother you to find a power connector what so ever, you can just put it in your trunk when you don't need it. 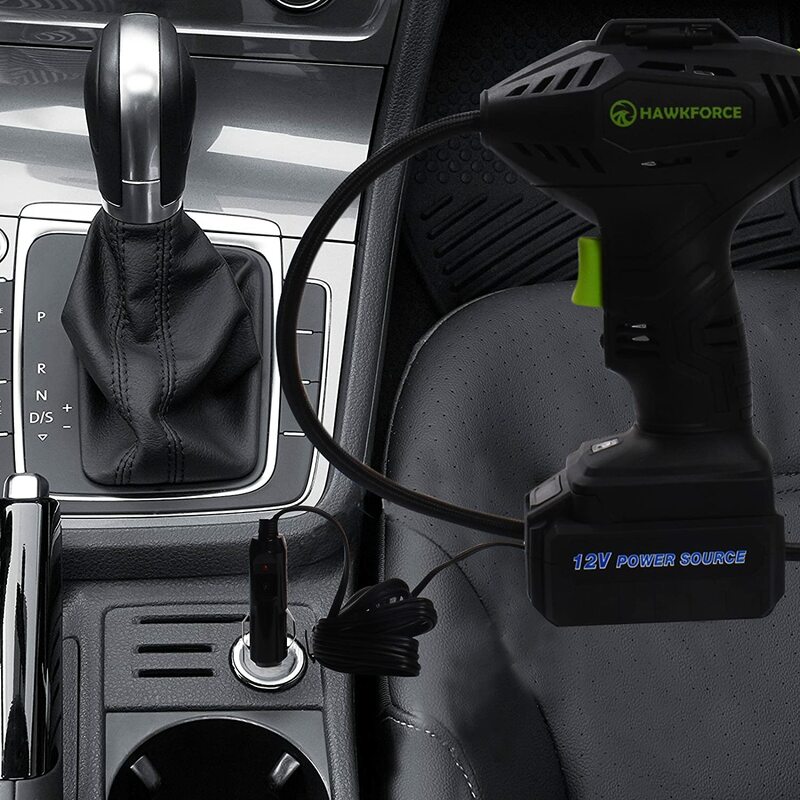 The battery is rechargeable, so you don't need to worry about connect to your car. For occasions, you can inflate balloons without finding a car. Also, did I mention about the power it has? 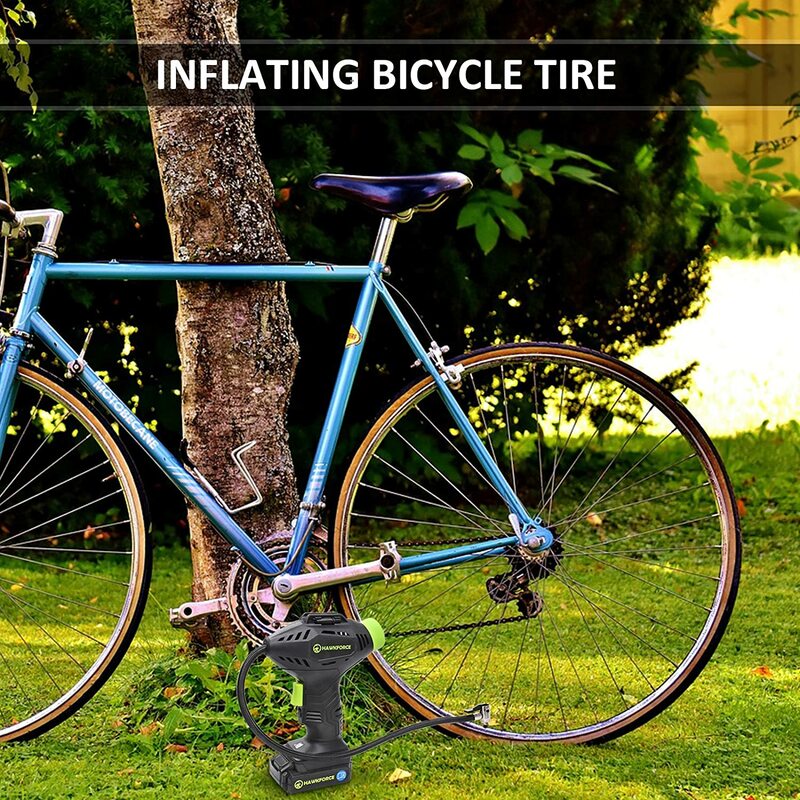 It is 150psi when it fully charge, which means you can inflate your all tires quickly. Great air pump!! I have 2 old cars that stay in the garage for weeks! When I want to drive them they usually have low tires so I love having this little tool! Only thing I wish it had was an auto stop once it reached a certain PSI. Other than that it's great! I was able to fill up 3 tires from one charge and it still had more juice! After just 2 months the battery no longer charges... donu2019t know if itu2019s a battery or charger problem. 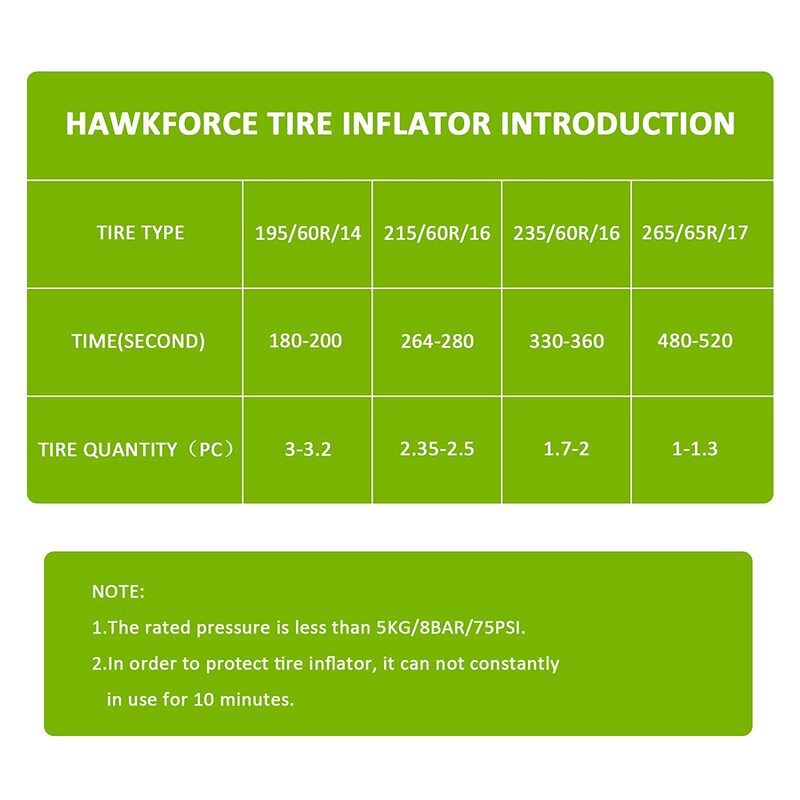 Now the air compressor is worthless and Iu2019m past the return window....Update-Hawkforce is sending out new compressor, great customer service. We will see if the new unit works and charges properly. This compressor packs a lot of punch, it does the job really quick topping off my car and bike tires. I love the way it fits right in your hand. I'm very happy with it and would purchase it again. 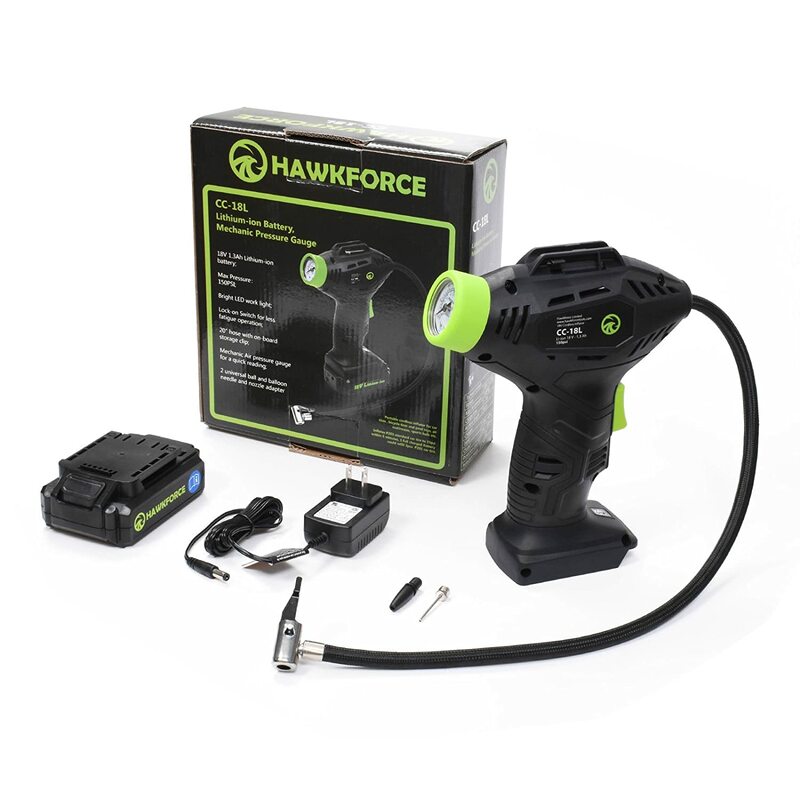 Hawkforce reached out to me after I posted this review and replaced the product. Doesn't change the first one breaking, but happy to see they stand behind their product. Worked great the first 2 times I used it. I use it remote control airplane pneumatic retracts. Today it just made a horrible noise and stopped working. Very disappointing since I've had it 5 weeks. Of course it is just after the return date. 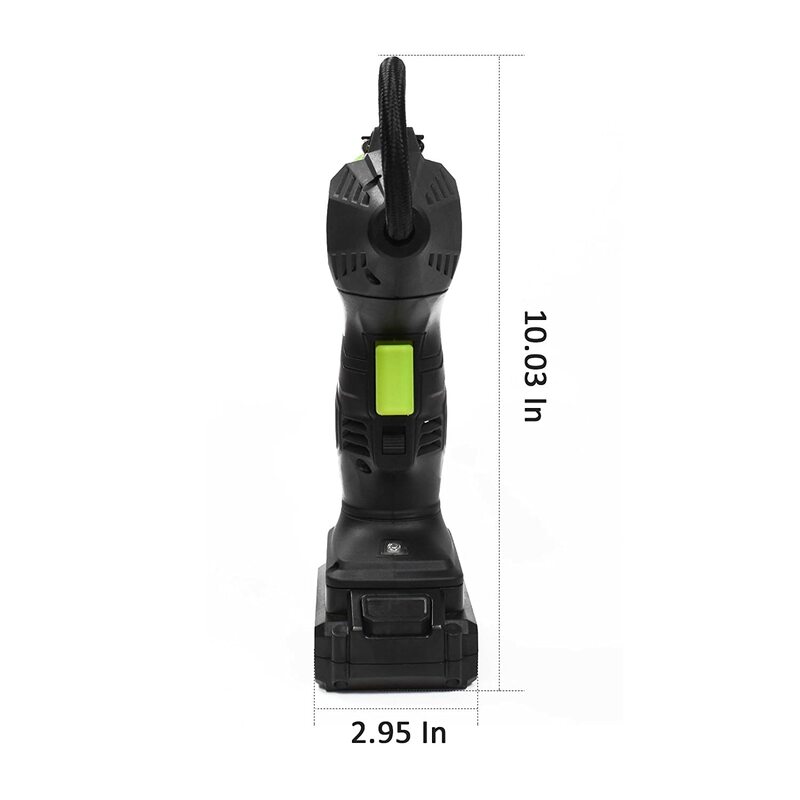 I like the easy grip; it is comfortable similar to holding a cordless drill. The compact size makes it very easy to store in the tire compartment in my Honda Fit. I tested in my Dodge Durango, which I seldom used, as I thought the air pressure was very low (25 PSI) it took just a couple of minutes to bring each tire to around 40 PSI. 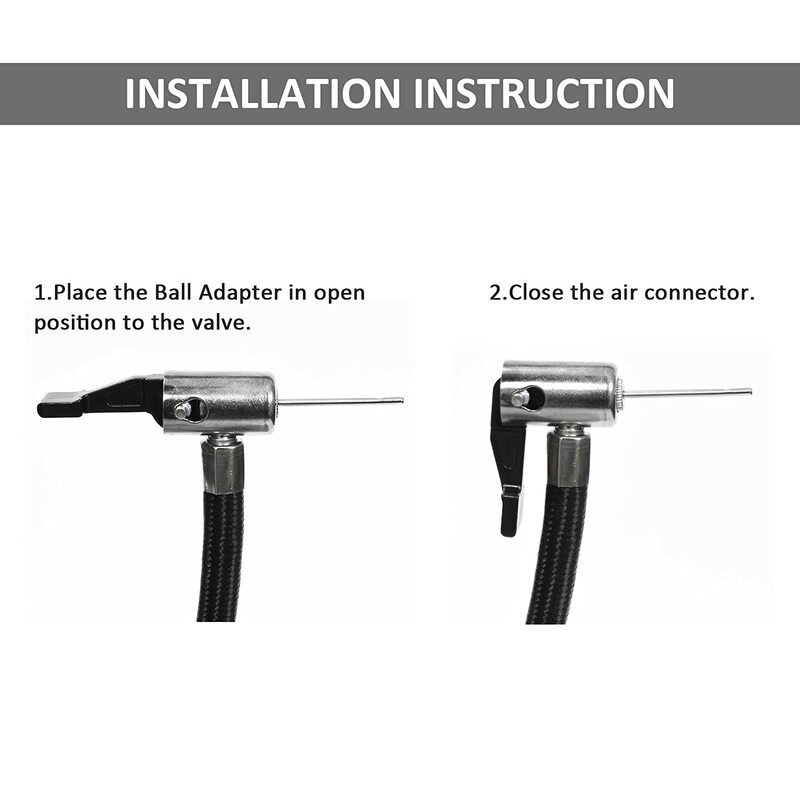 The hose is long enough to reach the valve, even when the valve is pointing up. 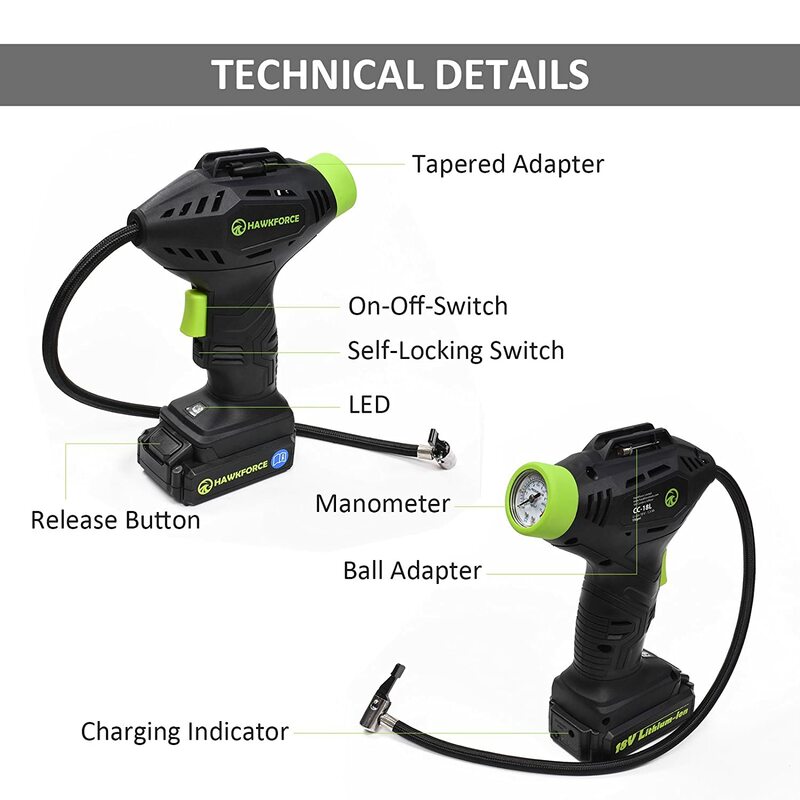 Other useful features are the push button to check the battery charge, the LED light that points towards the tire valve and makes it easier to connect the hose fitting to the valve at night. 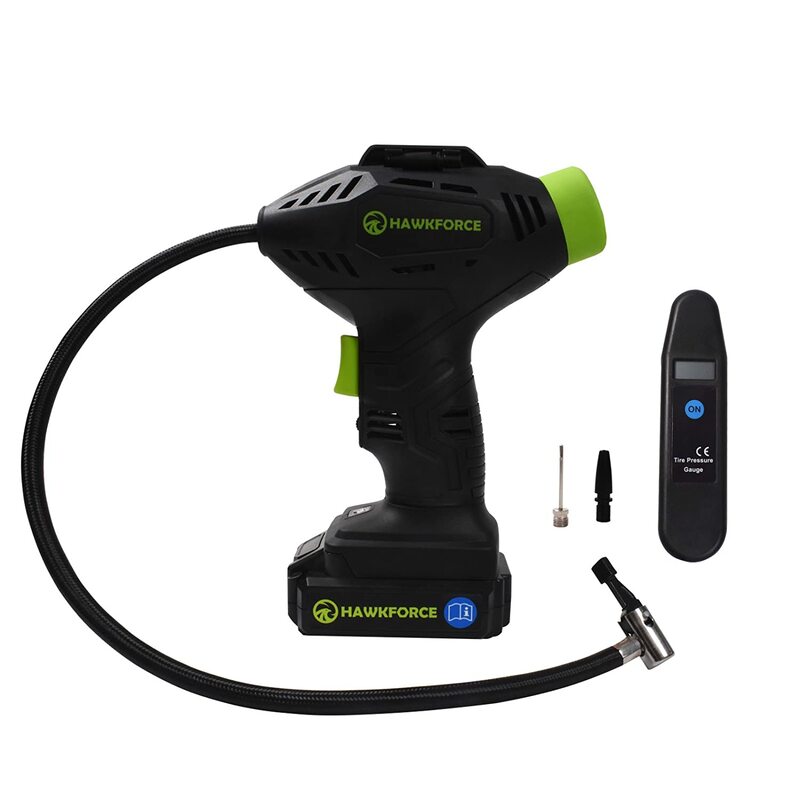 The battery has a push button that allows checking the remaining battery level, for this specific test the battery remained near optimum levels. The numbers showing in dial are 25, 50, 75, 100, 125, 150PSI. Each line /marker between those numbers in the dial, represent 5 PSI, so between 25 and 50 psi, there are five markings (30,35, 40, 45). 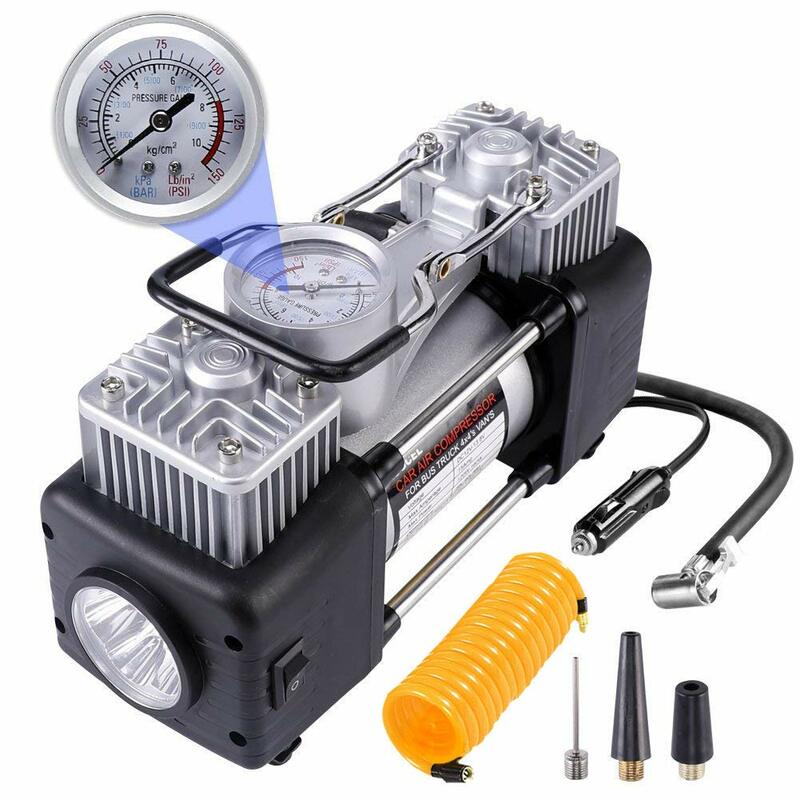 The dial in the compressor will help as a guide to inflate a tire that may be too low, in an emergency. However, one should use a calibrated pressure gauge to double check and adjust the pressure according to the vehicle requirements. The instructions manual is clear and easy to read. 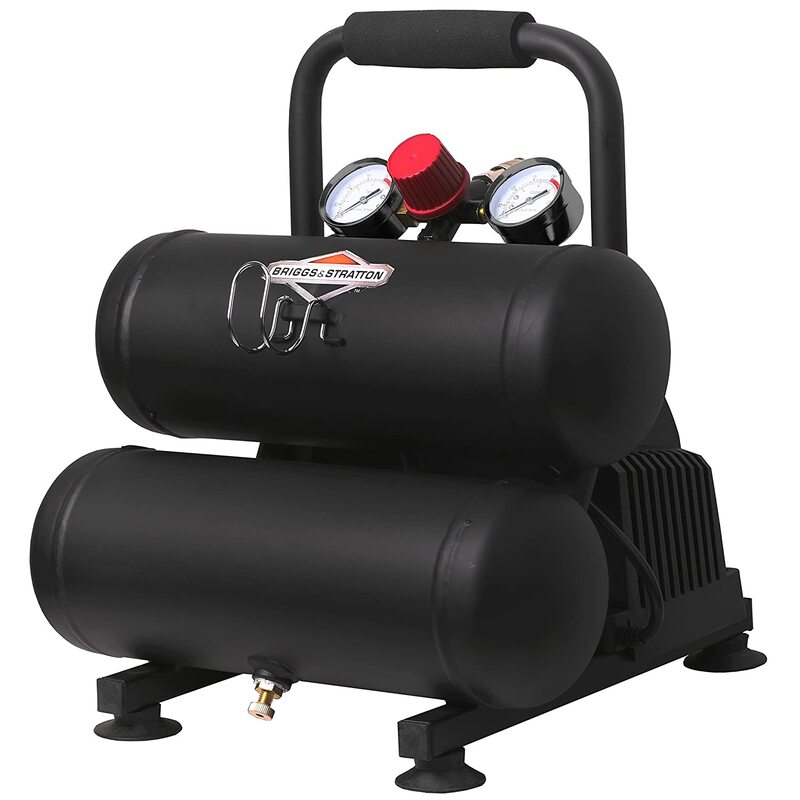 Overall I found the air compressor, easy to use, lightweight, easy to store in small cars, good enough for SUV tires. The compressor itself does just fine. 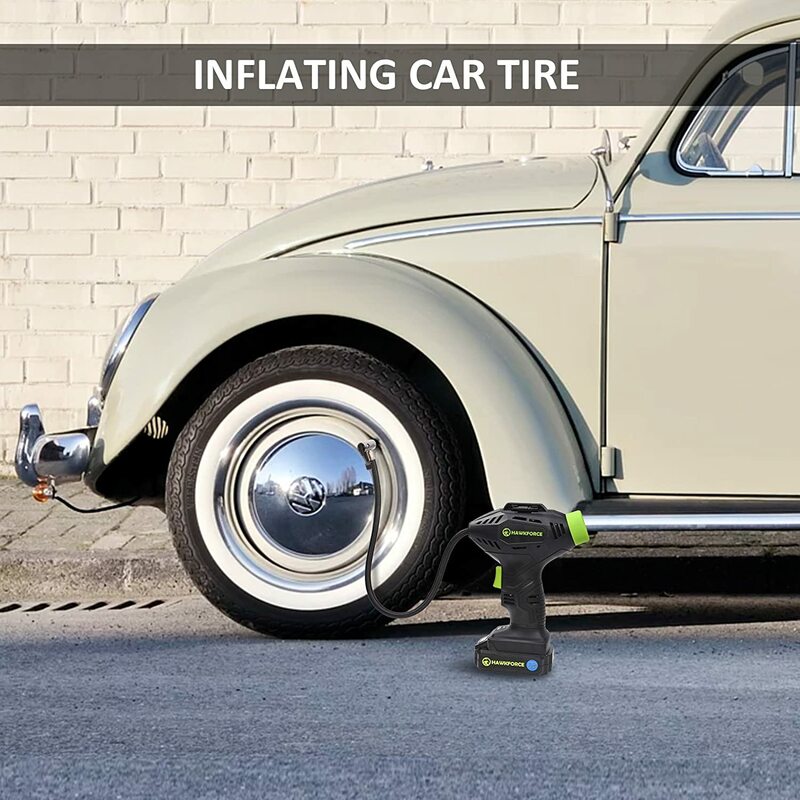 It's good for inflating tires, footballs or small accessories. 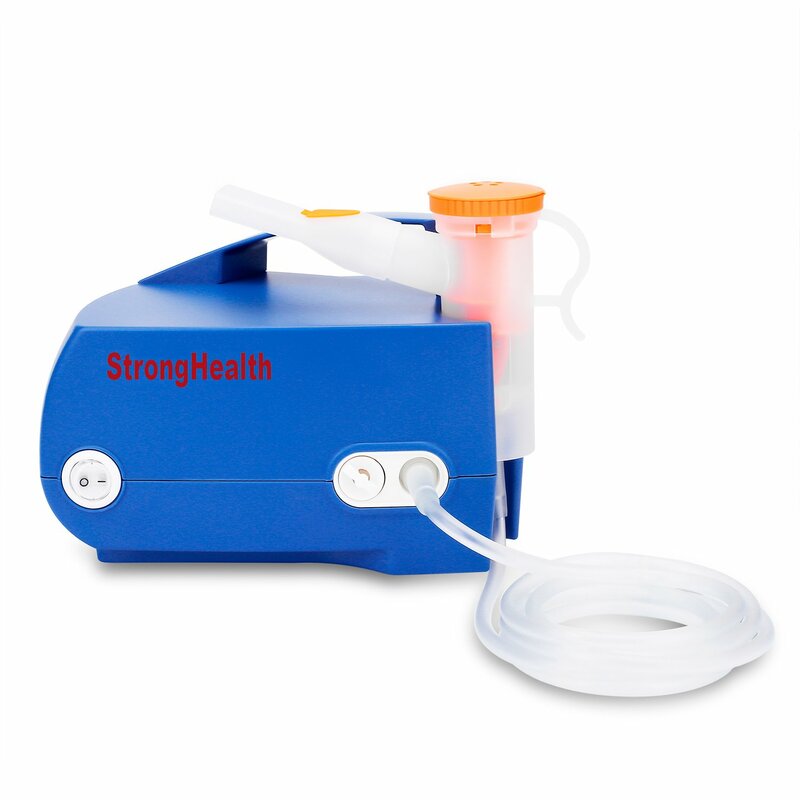 The kit gives you 2 nozzles to do everything, the compressor also has a trigger lock. So if your not in a hurry you could lock the compressor and leave it. 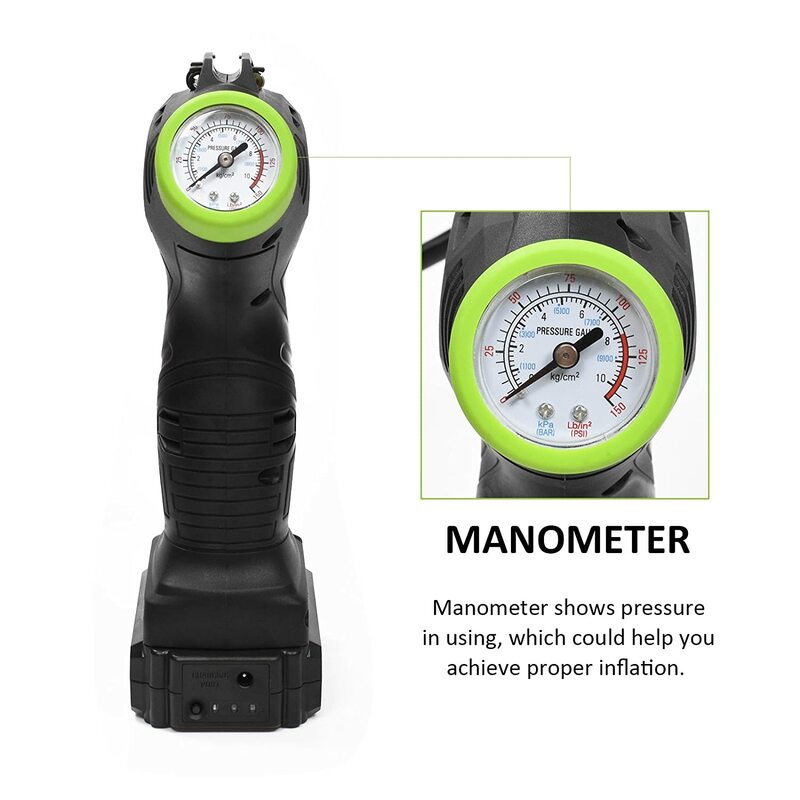 The manometer is simply AWESOME for car tires.